We live in such an amazing world full of miracles. The world is so vast and so intricate that only those who invest time to study the details of creation can really appreciate its beauty. Spending time with your child observing nature and learning the appropriate vocabulary will build your child’s understanding of the subject matter and reinforce its importance. Plants, animals, and humans surround us, beckoning to us to take a closer look. The solar and lunar orbits, the stars and planets, the moon and sun can be brought into our world to be studied and understood. Think about the human body-every breath we breathe, every pump of the heart, every organ, every limb. The thought should fascinate us and propel us to learn more. Why not then bring this wonderful subject to the four corners of your home? Don’t rely on your child’s school to get it all in. There are so many games and activities that will fascinate your children (and you too) while at the same time providing hours of fun. Inspire your children (ages 5-6) to learn while having fun with the Let’s Grow The Life Cycles Game. Your child will learn the different developmental stages of a chicken, frog, butterfly and plant. For all your ant-lovers try the AntWorks Colors of Life. Watch ants live, work and tunnel in the nutrious, non-toxic gel as they create series upon series of intricate tunnels. With the Multi-color LED Illuminator, a continuous light will shine through the clear gel. Try setting up your very own science lab in your home with the Big Bag of Science. This kit contains more than 70 fun and educational experiments for you to try out. This includes activities from all areas of science such as physical, earth and life. You can try activities such as making water disappear, having a liquid flow uphill, making a 30′ soda geyser, growing fake snow instantly, balancing 6 nails on the head of one nail – and much, much more. This is sure to entertain your children for hours on end! 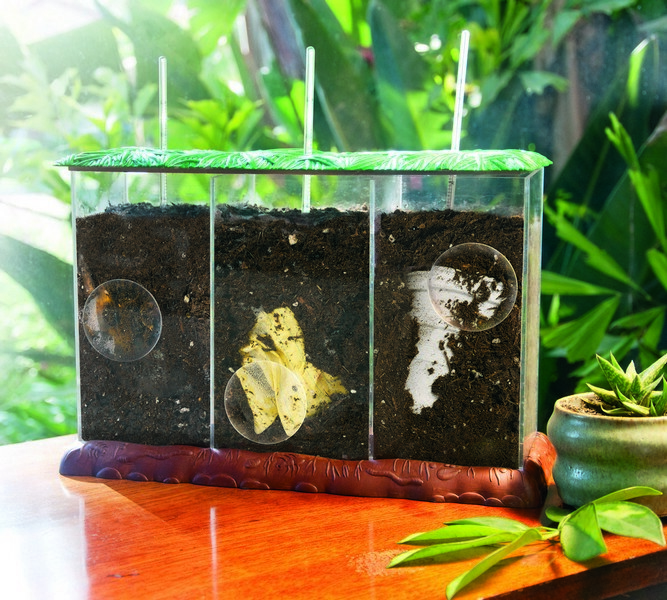 Looking for a plants oriented activity? Check out the Complete Rock, Mineral and Fossils Collection. 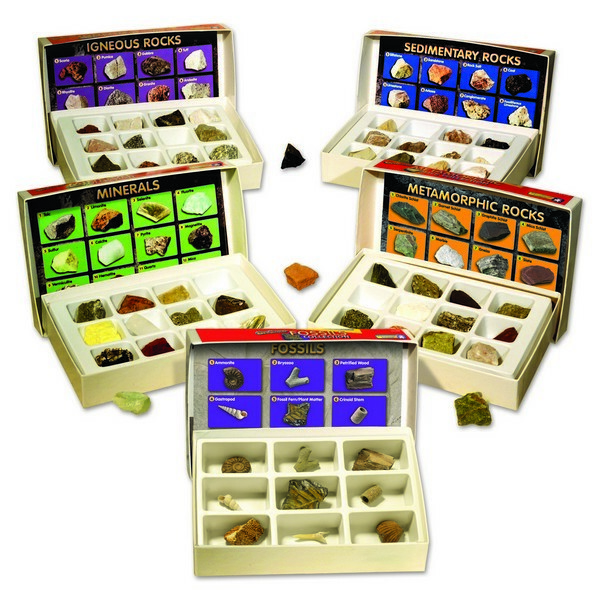 This activity set includes: Fossils Collection, Igneous Rock Collection, Metamorphic Rock Collection, Mineral Collection, and Sedimentary Rock Collection. Your child can now hold a 70-million-year-old fossil in his hand or an Igneous rock which was produced by hot volcanic magma action! Your child will surely be fascinated! Come check out all our other wonderful scientific products we have available at EducateWithToys and you’ll be able to rest assured that your children are having a great time while learning about our wonderful world! Science: Study The Details Of Creation And Appreciate Its Beauty. We live in a wondeful world of miracles. The world is so vast and so intricate that only those who invest time to study the details of creation can really appreiciate its beauty. Spending time with your child observing nature and learning the appropriate vocabulary will build your child’s understanding of the subject matter and reinforce its importance. Plants, animals, and humans surround us, beckoning to us to take a closer look. The solar and lunar orbits, the stars and planets, the moon and sun can be brought into our world to be studied and understood. Think about the human body-every breath we breathe, every pump of the heart, every organ, every limb-the thought should facinate us and propell us to learn more.